Guernsey and Jersey are established international centres of business and finance. Stable, business-friendly with a highly skilled workforce, they have a strong occupier base of financial services firms. Jersey’s office stock, focused on St Helier, is approximately 3 million sq ft. Guernsey’s office stock is concentrated in St Peter Port, and at Admiral Park, a newer mixed use development to the north of St Peter Port. 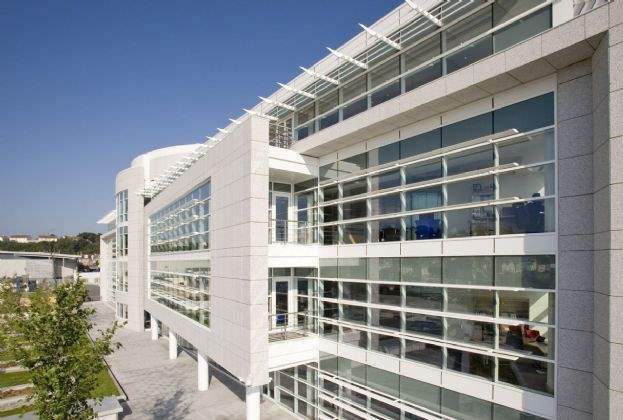 Guernsey’s office stock totals 1,700,000 sq ft. In 2014, Jersey’s island plan identified the Esplanade as the primary area for office development and is now the prime office location. Known as the International Finance Centre Jersey (IFC), it will ultimately deliver 470,000 sq ft across six stand-alone buildings. If developed as planned, it will add 16% to existing office stock and has the potential to drive the supply and demand dynamics of the office market for a number of years to come. There are two developers of major office accommodation in Jersey, the Jersey Development Company, developer of the IFC, and Dandara. The latter’s office developments have been focused at the Esplanade (across from the IFC), and include a 180,000 sq ft partially speculative building (now fully let). In Guernsey, a slew of new office development occurred between 2005 and 2010, focused at Admiral Park and on the Glategny Esplanade. Outline planning permission is in place for the remaining plots at Admiral Park. The first phase of this would be a 61,000 sq ft office building, with a proposed completion date of 2021. 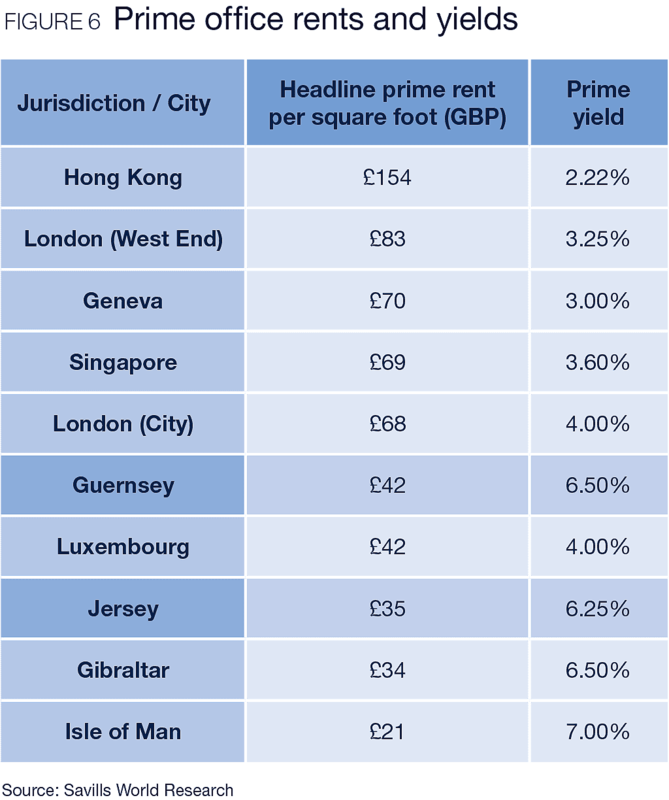 Grade A office rents in Jersey stand at £35 per sq ft, and £42 per sq ft in Guernsey. 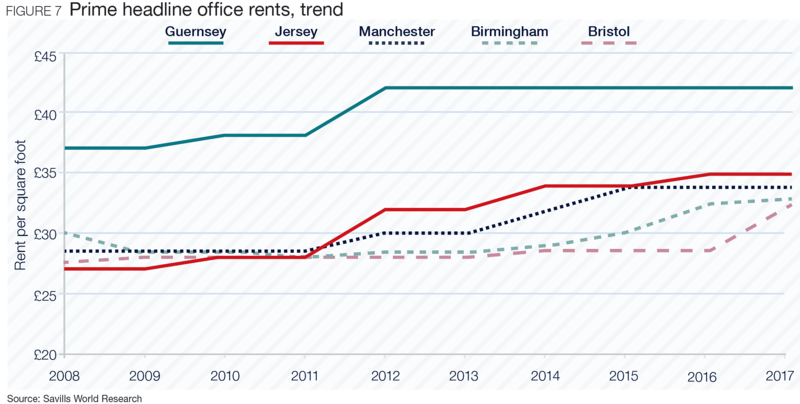 Jersey office rents have grown by 9% since 2012. Guernsey office rents have remained broadly static over the last five years. 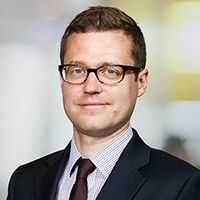 Occupier demand for Grade A space comes from major financial services firms, with recent relocations in Jersey including BNP Paribas and Royal Bank of Canada. 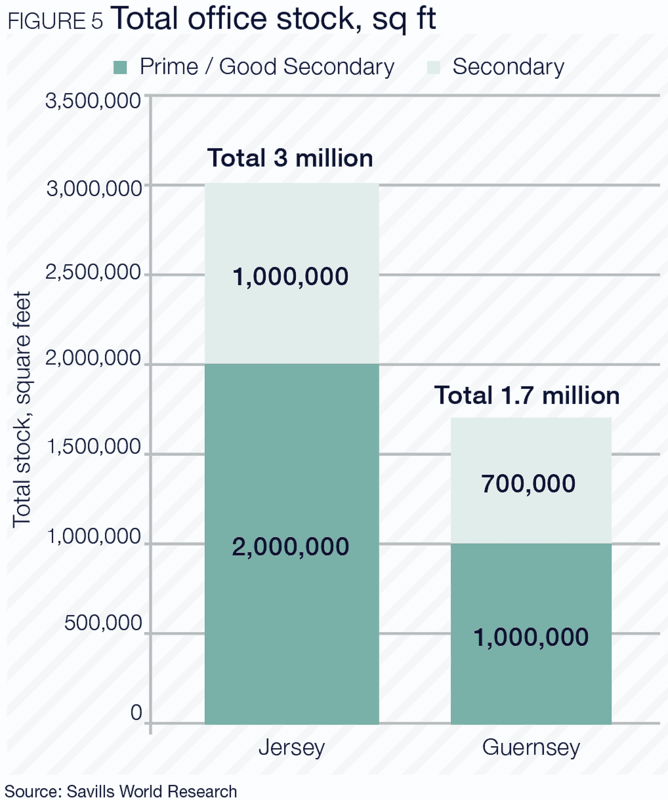 Take-up of prime and good secondary space in Jersey averaged 100,000 sq ft per annum between 2014 and 2017, and 20,000 sq ft per annum in Guernsey. Vacancy rates in both islands are estimated at 10%, but 5% among prime stock in Jersey, and just 2% among prime stock in Guernsey. ■ There is no landlord or tenant legislation. ■ There are no automatic rights of renewal at lease expiry, or any rights to hold over. ■ There is no automatic right of release of assignor from liabilities at assignment. ■ Rent reviews are generally every three years. 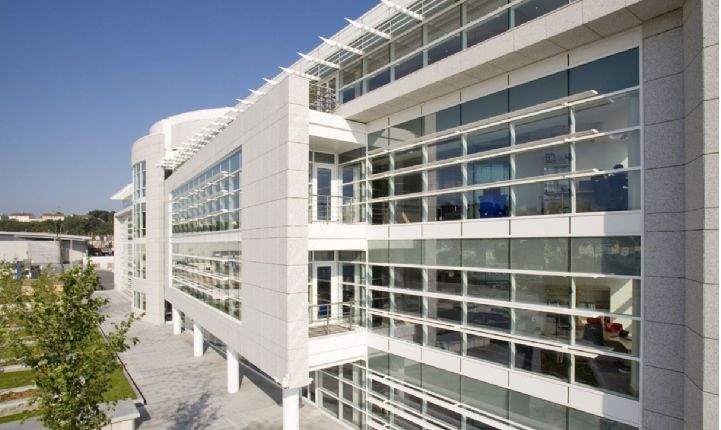 There exists solid demand for prime office buildings from both domestic and international investors, thanks to good covenant strengths, appealing long lease structures and a stable economy. 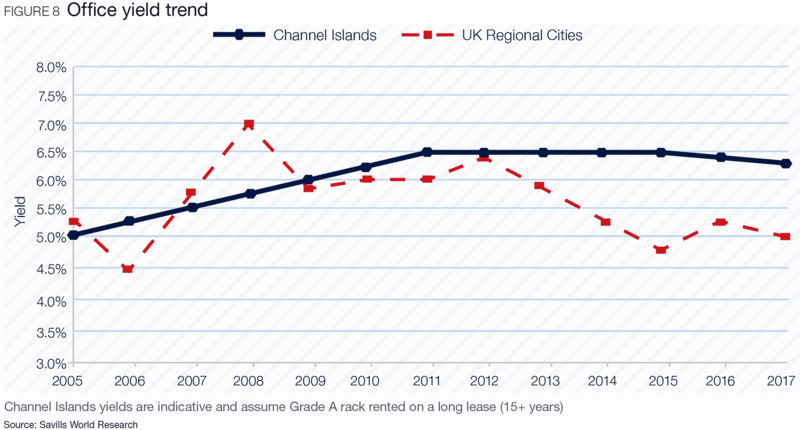 Yields in the Channel Islands are 100bps higher than regional offices in the UK. UK. The markets have their own particular drivers so those with local expertise have historically led investment activity. That said, international institutional investors including Standard Life, Brockton Capital and Stenprop have made major acquisitions in recent years. Office using employment remains steady with modest growth. Wider geo-political uncertainty withstanding, medium term prospects for the occupier demand appear to be stable. While Guernsey saw a wave of new office completions between 2005 and 2010, there has been little since and none expected in the near term. This will help to sustain rents for quality stock at current high levels, but means options for tenants are increasingly limited. In Jersey in particular, several large occupiers are located across inefficient multiple sites, and/or outdated premises. New development at the IFC and surrounding it will drive further relocations of office occupiers to the larger floorplate, higher quality space on offer. Assuming the extensive pipeline is developed as pre-lets are in place, the supply/ demand balance should be maintained as St Helier’s office stock is expanded and brought up to international standards.